≡ Argentinean composer and bandoneon master Dino Saluzzi's group includes many family members including José Maria Saluzzi on guitars, Felix "Cuchara" Saluzzi playing saxophones and clarinet, and Matias Saluzzi is featured on acoustic and electric bass, with the great Italian drummer U.T. Ghandi on hand for this session recorded at home in Buenos Aires. Juan Condori is Saluzzi at his most relaxed and instinctive. This music is deeply embedded in the folk traditions of the region, as well as the tango and the ballroom music of the country, both rural and urban in an era long gone. The title of the set refers to an old childhood friend from an indigenous family who Saluzzi refers to as "an almost magical figure." Clocking in at over 76 minutes, this is one of those dates where one piece seems to naturally flow into the next, the warmth of the ensemble, and their instinctive familiarity with one another in the title track, where what amounts to a kind of memento mori is played for the namesake. The sounds of the mountains, the sunset, the trees and the lush valleys evoke a time that has always been previous. 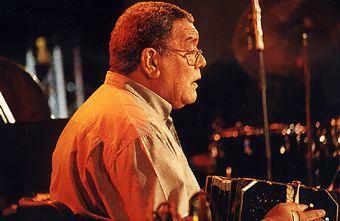 The interplay between bandoneon and acoustic guitar is simply as mysterious as it is mournful. Different modes and melodies enter and leave and note the passage of time -- in years, not minutes -- until an absolute kind of free improvisation takes over for a tumultuous moment and Cuchara's clarinet brings it all back into the stillness again. He is the one who takes the tune out on his tenor as well, playing slow, low, growling notes. As if to underscore this, "Memoria," begins almost out of the silence of the previous track, playing an askew kind of tango that doesn't fall into three/four, but challenges the form as electric guitar and bandoneon play counterpoint with one another. "La Parecida" is almost a celebration by contrast, but it too is by turns knotty and almost pastoral. Saluzzi's bandoneon rings out a sweet song as bass, guitar, drums and acoustic guitar follow him into a dance that becomes by turns dramatic and dynamic -- especially as Cuchara enters. All of this is cyclical, as is José Maria's acoustic guitar and the soprano saxophone engaging in a melodic improvisation that underscores the song with ferocity. While Manfred Eicher's production is, as usual, signature, he is able to respond to this family band and warm things up considerably without giving up an ounce of clarity or pristine presentation. Juan Condori is one of those recordings where jazz, folk music, and improvisation all wind themselves into the notion of a complex but utterly beguiling song. ≡ Strongly atmospheric and exploratory music from an established artist who continues to push the boundaries of his chosen form. ≡ This is a set of haunting melodies that don’t come from anywhere near the jazz tradition – but an improvisational spark keeps appearing. … There’s a tango classic that develops dark, stealthy investigations in between visits to the main theme, and the title track is a captivating exchange between bandoneon and guitar. There’s a short group improvisation as still as church music, and constant reflections of both the exhilaration and sadness of the tango. The sax sound and guitarist José Saluzzi’s jazzy phrasing broaden this set’s appeal and the spontaneous empathy of the players reaches out. ≡ This is a very warm, approachable album both in texture and in its rhythms. Tango is more than an idea or a pulse; it is the framework on which the songs are hung. … There has always been conflict – or at least tension – in Saluzzi’s compositions. It stems from his reverence for a certain kind of humanity and an ancient, rural way of life that is – by virtue of his vocation – beyond his grasp. But on Juan Condori, the dialogue is harmonious and the mood lyrical. Tango, the product of immigrant alienation and nostalgia, here turns in on itself, easing the soul of the exiled musician-intellectual. ≡ Celui qui a brillamment joué avec le Rosamunde Quartett, Maria João, Enrico Rava, Al Di Meola, Marc Johnson ou Palle Danielsson, c’est en famille qu’il improvise le mieux la « milonga » de ses propres amours. ≡ Wenn der argentinische Bandoneon-Improvisator Dino Saluzzi auf seinem neuen Album auch einen Tangoklassiker spielt, dann als Erinnerung an eine der Musiktraditionen, die ihn prägten…, der er aber seit langem entwachsen ist. ... Derlei Folk-Anleihen weiterzuentwickeln, zu öffnen, bis ins freie Terrain hinein, braucht man Musiker, die den Komponisten und seine regionalen „roots“ kennen, jede Andeutung verstehen, aufgreifen, transformieren. ... Vertraut, wie sie auf ihren „Ober-Saluzzi“ eingehen können, bringen die Verwandten dessen Musik in einen organischen, scheinbar nicht enden wollenden Fluss von atmosphärischer Dichte und emotionaler Tiefe. ≡ Die ganze Familie ist mit von der Partie. Sohn José Maria verzaubert mit eindringlichen Gitarrentönen. Dinos Bruder Felix, dessen Sohn Matias und U.T. Gandhi steuern mit Saxophon, Klarinette, Bass und Schlagzeug städtische, von Jazz und Schlagern infizierte Klänge bei. Vom tiefen Verständnis der Quintettmitglieder getragen, changieren die bis ins feinste Detail nuancenreich aufgezeichneten Songs zwischen introvertierter Melancholie und extrovertiertem Vergnügen.